"Makes your mine cart or rocket barrel temporarily invincible!" The Crash Guard, in Donkey Kong Country Returns 3D. The Crash Guard is an item found in the New Mode of the Nintendo 3DS remake of Donkey Kong Country Returns, Donkey Kong Country Returns 3D. It resembles the Banana Juice, except the liquid is colored white. It can be purchased from Cranky Kong's Shop for ten Banana Coins. The Crash Guard can only be used in levels which feature either a Minecart or Rocket Barrel section. When used, it protects Donkey Kong and Diddy Kong from getting hit by up to two enemies or obstacles when using one of said vehicles. If a second or third Crash Guard is added to the player's inventory before entering the stage, Donkey Kong and Diddy Kong can survive four or six hits, respectively. The Crash Guard returns in Donkey Kong Country: Tropical Freeze, and can be bought at Funky's Fly 'n' Buy. 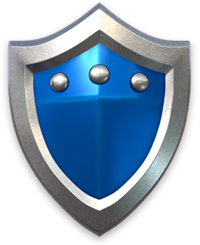 This time, it takes the form of a blue shield. Also, unlike in Donkey Kong Country Returns 3D, the Crash Guard only protects the Kongs from taking damage once, partly because the Cart and Rocket Barrel can now take up to two hits before an Extra Life Balloon is lost. In the Nintendo Switch version, the Crash Guard is recolored green, but it still operates the same way as in the original Wii U version. When highlighting the Crash Guard in Donkey Kong Country: Tropical Freeze, Funky Kong will say "Vehicle troubles? It's dangerous to go alone--take one of these! ", referencing the quote "It's dangerous to go alone. Take this!" from the first The Legend of Zelda game. This page was last edited on September 24, 2018, at 18:02.